FastStone is nicely customizable to one's needs. 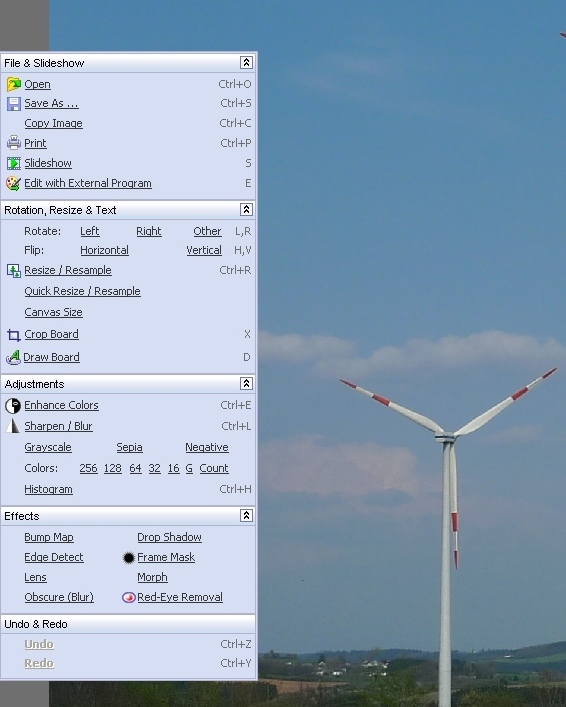 Language, skin, background colour, standard procedures, saving qualities, file handler links to other software applications and a lot of more functions can be easily adjusted. Therefor it is worth to have a closer look into the preferences. 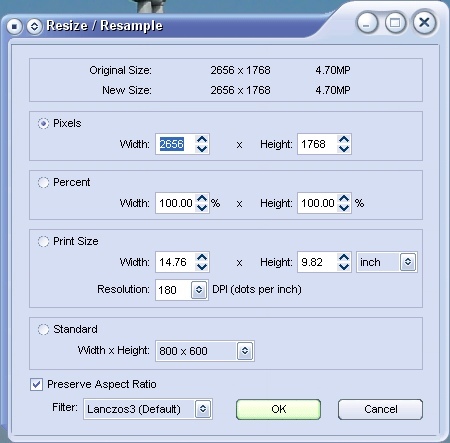 Step 1: Before starting to resize a photograph with FastStone, you should save a full sized copy of the original picture to be able to get back to it, or you should make sure to use exclusively the 'Save as...' function and rename the resized version of your picture at the end of the procedure. Here is a look at the first appearance. FastStone remembers the last directory or opens the new directory, if you just uploaded pictures, videos, etc. from the card reader. A double click on one of the thumbnails opens that picture in full screen mode ('esc' or a mouse-wheel click will bring you back). 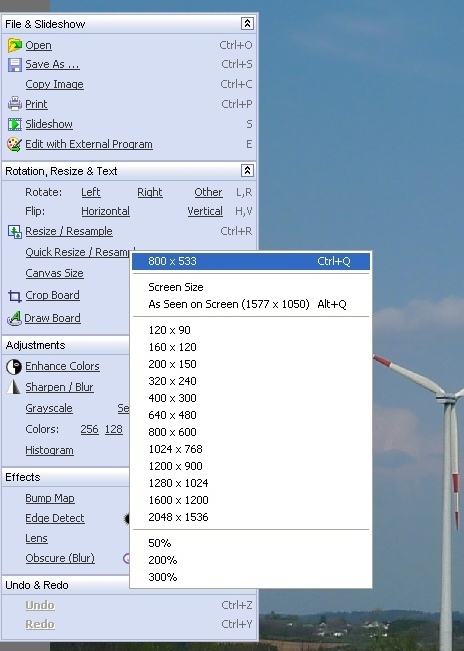 Moving the mouse to any side of the screen opens different info- and function sets. Scrolling the wheel shows the next picture/movie. Step 2: This picture has a size of 2656 x 1768 pixel. We're going to downsize it to a maximum width (because the width is the longest side in this case) of 800 pixel, keeping the aspect ratio (first job) and a file size below 250KB (second job). 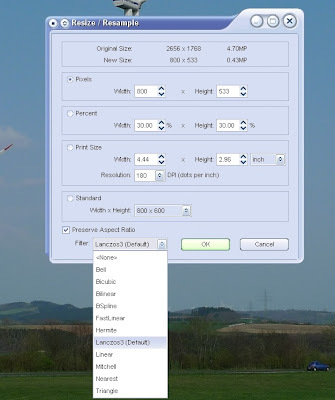 Step 3: The normal 'Resize' menu button opens a settings window, where we can type in the desired width or hight. Here we type a '800' into the marked box. In each case the ratio is kept, as long as the 'Preserve Aspect Ratio' box is checked. Very nice is the possibility to choose the desired resizing algorithm (Filter). The Lanczos3 Filter does the best job, IMO. Step 4: Click on the 'OK' button. Now the downsized picture is shown in full screen mode. The first job is done! Often it is a good idea for a little bit of resharpening at this point of the procedure. We could use the functions, which appear by moving the mouse to the left of the screen. But the need for sharpening depends on the subject. It's not always necessary. 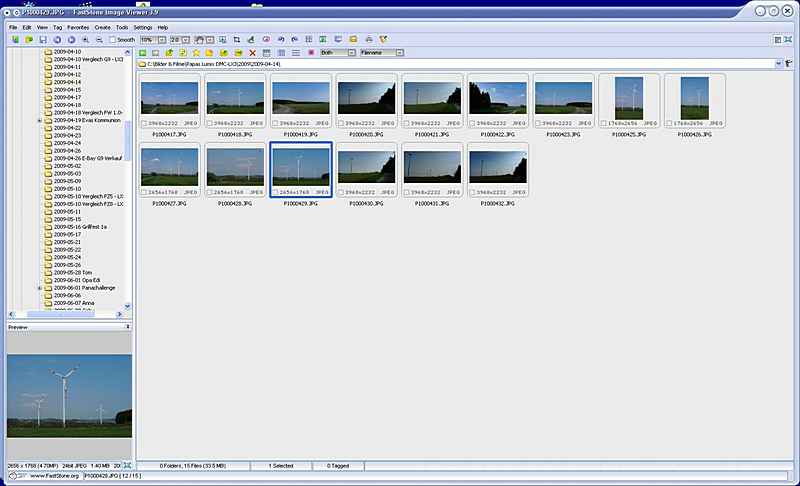 Our next step is to adjust the file size (in KByte) before we save the picture in it's new dimensions. Again we use the functions menu on the left and click on the 'Save As...' button. 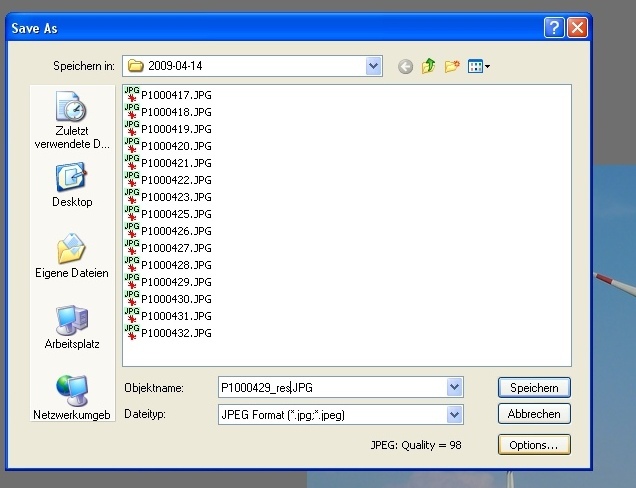 A saving menu appears, showing the directory of the original file. Important: Rename the file to create a new version of it! Otherwise your Original is gone. Step 5: Within that saving menu you can see an 'Options' button. This is where we can adjust the file size. 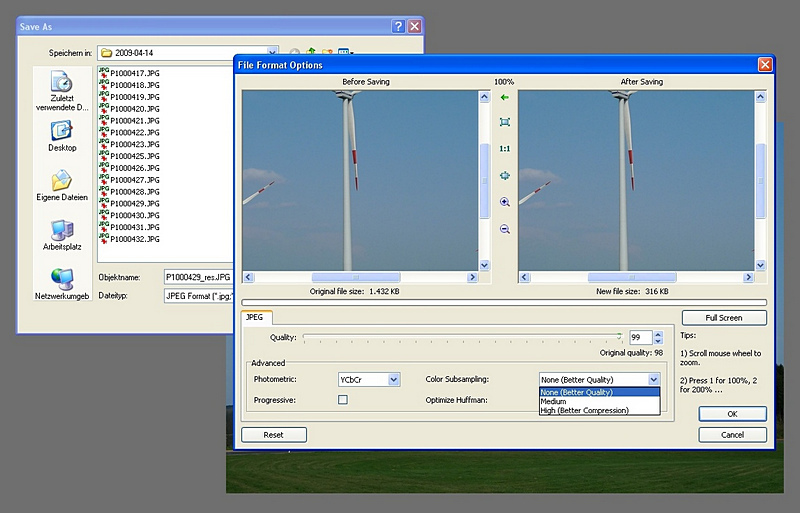 Make sure that 'No Colour Subsampling' is selected from the drop-down menu. This preserves the best image quality. You can make this to the default setting within the software preferences. 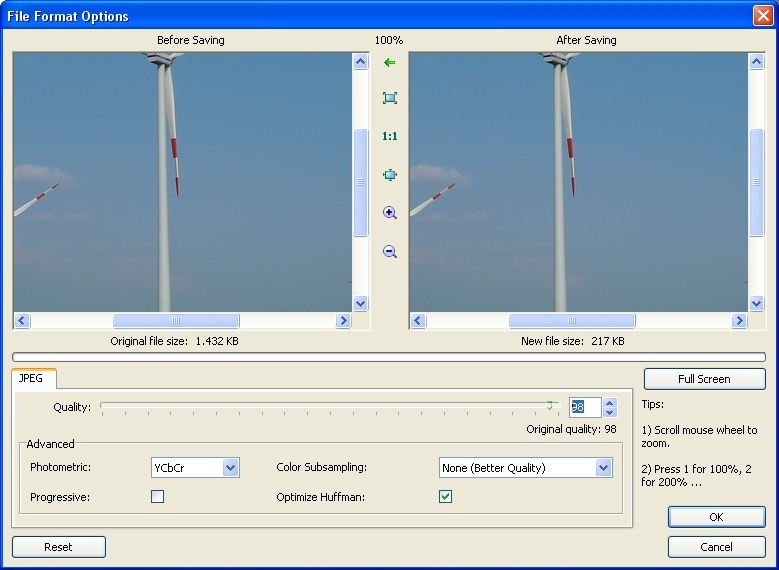 This 'File Format Options' window shows the picture and its size before and after saving. Here we can control the file size and adjust it below 250KB. 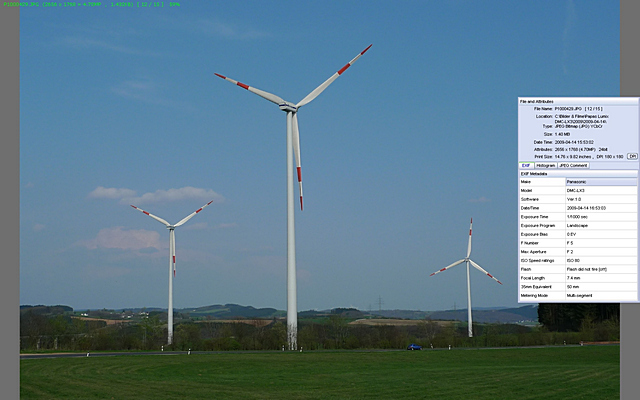 Our shrunk windmill picture still has the file size of 316 KB - too big for the Panachallenge. By lowering the quality value in the marked box, we can adjust the file size to be under 250KB. Therefor we lower the JPEG quality from 99 to 98. Now the file size is 217KB. The second job is done. Step 6: Affirm this setting by clicking the 'OK' button. That brings us back to the saving menu. Click the 'save' button and your done. Ok, just downloaded & tried -- it works!! it does a great (and friendly simple) job resizing the pics, and also has nice basic controls for tuning colour, contrast and the like... a worthy one for a fast processing, many thanks Franz!! Hi Franz: Thank you for this - I will check it out. On a quick first read I noticed the file size you were aiming for was 250KB. I wondered why you would choose this size when the challenge rules say 200KB - Then I checked the rules - DUH So thank you for getting the size of my entries up a little - boy I feel dumb! I use it for almost 2 years now and find myself using it more often than The Gimp, Picasa and even IrfanView by now. Surely it is far from the sophistication of The Gimp, Lightroom, Photoshop and Paint Shop, but it does its jobs quickly and with high precision - meaning it uses a very good set of filters and algorithms. For example a so called "lossless rotation" actually is lossless and does not soften your pictures beyond recognition like Picasa does it to date. FastStone even handles RAW-files. But I really don't know how good it does with this. I don't have enough experience with RAW processing. But there are a few drawbacks too!!! Please don't ever try to print photographs with FastStone! Puhh! This is bad! I really don't want to owe you new sheets of photo paper and new ink cartridges! Somehow they did not manage this task till now...! ?! But FastStone can send the pictures to the printer software with a click on the right mouse button (if you prepared this) and that is more than I would expect from a free tool! Maybe the new version 4.0 is better though. Although I have too many processing programs to even want to count and they all have resizing ability, I still enjoy FastStone as a quick image viewer. The interface is clean and the program well written and very fast. You can't beat the price either! Thank you for taking the time to share the resizing tutorial. It is a valuable reference for our members. I have been using GIMP up until now to resize my pictures.... this program seems to resize with little to no reduction in picture quality which I was struggling with in GIMP. I will use this from now on!! !